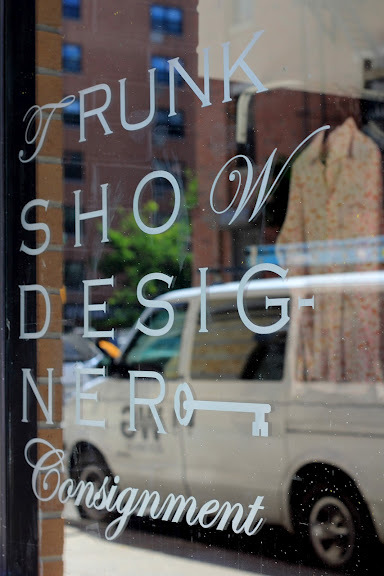 Trunk Show Designer Consignment in Harlem celebrated their first full year of business this past weekend. They opened for business in July 2012. A big congrats to them and continued to success! Wondering how Trunk Show Designer Consignment in Harlem works? If you are a consumer of high-end labels or luxury clothing goods and would like to get some sort of return on your luxury merchandise, stop by TSDC, located at 275-277 West 113th Street, between ACP and FDB. You maybe able to cash in on your luxury goods depending on the state of the item(s). According to their consignment policy, seasonal merchandise is accepted on a consignment basis Tuesday through Saturday by appointment only. The consignment split for all items sold at TSDC is 50/50. Learn more about Trunk Show Designer Consignment Harlem here. Or better yet, stop by and visit TSDC to view and shop their merchandise or drop off luxury goods to consign or just stop by to say congrats for TSDC turning one. We just received Harlem’s Polished FingerTips electronic newsletter and noticed that Spa Week is coming up starting April 15 until April 22. 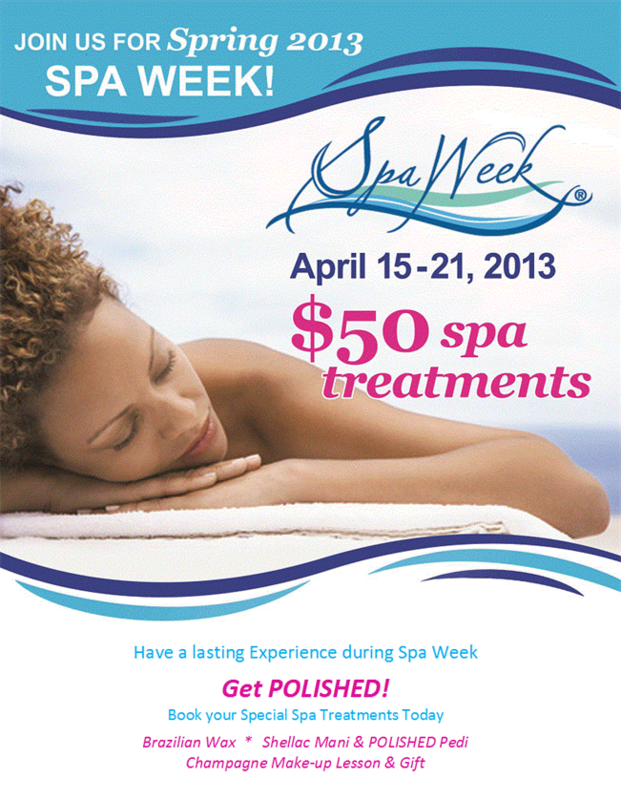 Enjoy a variety of spa treatments for $50 for this one special week. To learn more about Spa Week at Polish FingerTips, go to their website or give them a shout. Contact details are listed below. Need plans Friday night that will take care of your wine shopping needs? 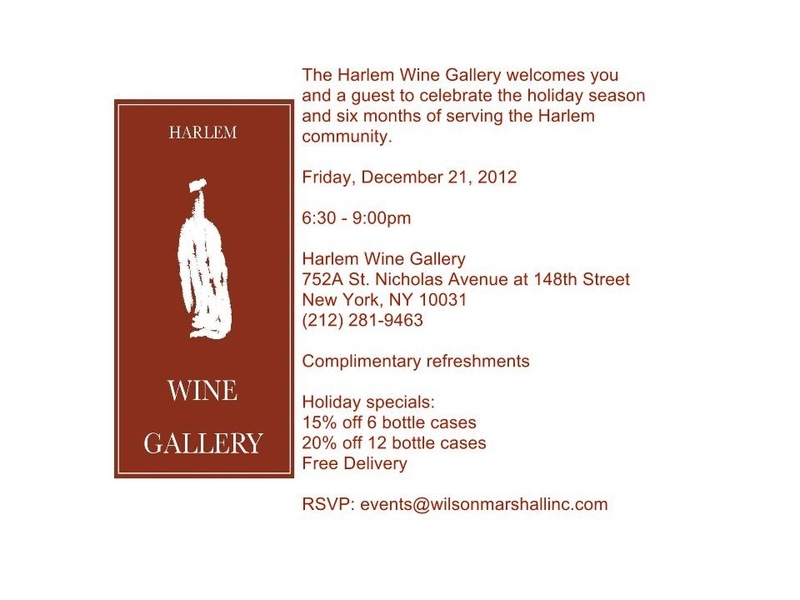 Consider the Harlem Wine Gallery in Harlem’s Hamilton Heights. They’re having a party this Friday evening, Dec. 21st that includes discounts on wine. Check out the details below and if you’re planning on attending don’t forget to RSVP. Where to purchase a Harlem tee? A reader from Plano, Texas recently wrote HarlemGal Inc asking where can one purchase a t-shirt that says Harlem on it if one doesn’t live in Harlem? The answer: there are plenty of options to purchase a Harlem tee if you don’t live in Harlem! The largest Harlem online community on Facebook known as Harlem NYC recently started to sell unisex t-shirts that say…what else, but Harlem NYC on it. Go here to purchase a t-shirt for $12.50. To get that price, more than 50 t-shirts have to be printed. On twitter, several followers have told HarlemGal that a site called Harlem Lives sells men and women t-shirts that say Harlem on it. And apparently, there is a sale going on at this site according to a follower. Harlem Lives tees run from about $19 to $25. 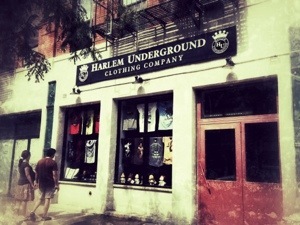 Harlem Underground offers consumers the opportunity to buy Harlem t-shirts online and in stores as well. Harlem Underground has two locations. Their first is on 20 East 125th Street. And recently, they opened their second store in Harlem on Frederick Douglass Blvd between 119th Street and 120th. Harlem Underground tees cost from $16 all the way up to $30. Harlem t-shirts are also offered in stores only at Swing Concept and Bebenoir in Harlem. And let’s not forget along 125th Street. Street vendors sell Harlem t-shirts for as low as $10! If there are other places to purchase Harlem t-shirts, drop us line here in the comments section! After being gone from Harlem a few days and returning to all the depressing reports about several businesses closing, I had to seek out new and inspiring information to blog about. I didn’t have to go far thanks to Harlem readers filling my inbox. I came across information sent in-and oh so cute-about Cabbages & Kings. You’re probably asking, what is that? Hint: Harlem mom’s may want to listen up! 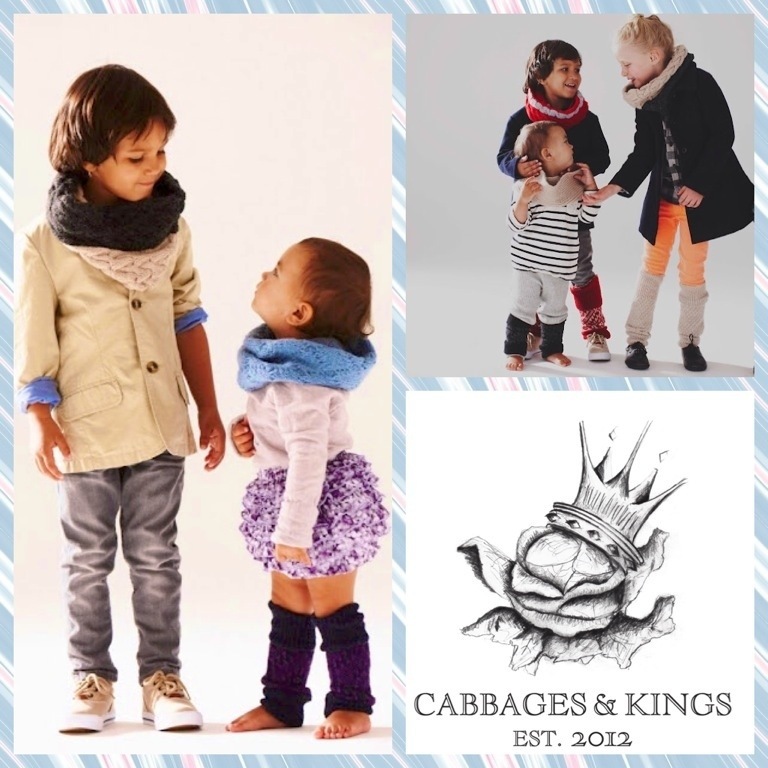 Cabbages & Kings is an online kids clothing store that was recently started by Alexandra Gizela, a Harlem resident, mom, and a native New Yorker. Cabbages & Kings offers “multi-functional, design-conscious accessory line for kids, with their current collection comprised of scarves and leg warmers.” When I checked out their website, I immediately fell in love with the turquoise leg warmers for infants and then I had to learn more about this Harlem mommy/entrepreneur. So I presented a few questions to fellow Harlem Gal Alex Gizela and here is what she had to say. HG: How long have you lived in Harlem? AG: I am from New York City originally. I grew up on the Upper Eastside, lived in Chelsea and am now I have made Harlem my home. I have been in Harlem for close to 5 years. HG: What’s your favorite thing to do in Harlem with your child? AG: I love going with Luella to Morningside Park! Luella’s favorite part of this Harlem park is the pond where the turtles sun bath. HG: Do you have plans to sell your product locally at a store in Harlem? AG: Yes, right now I am online only. However, I am definitely looking to sell in specialty boutiques come September. There are not many boutiques in Harlem, however I am thinking of targeting places such as Swing, Aysa Boutique, You Me N’ Dupri, maybe Grandma’s Place-even though they mostly offer toys. Who knows? Maybe they [Grandma’s Place] will introduce some accessories! HG: Aside from the leggings and scarves, do you plan to expand beyond those products? AG: For now, I am focusing on accessories, but there are some additional items that are brewing for Fall/Winter 2013. HG: And why should Harlemites buy your product? AG: Because Harlemites are cool and are ahead of the game…mirroring Cabbages & Kings. To learn more about Alexandra and her Cabbages & Kings, check out her website! Congrats to Harlem Shambles! Check it out for your barbecuing or everyday meal needs. They are located 2141 Frederick Douglass Blvd. between 115th and 116th Street. Their phone number is 1 (646) 476-4650. HarlemGal Inc’s photostream on Flickr. Harlem Week 2011 kicked off today, July 31, with much success. There were plenty of New Yorker’s in attendance who wanted to partake in this years theme, “A New York State of Mind.” I certainly did and enjoyed the kick off celebration very much. I checked out all the street vendors and camped out at the Macy’s Food Truck, which was featuring free food by Marcus Samuelsson. If you were not able to check out Harlem Week 2011 kick off today, do not worry. There is a month full of activities planned for August. For additional details, go to Harlem Week’s website. W. 126th St. & Riverside Dr. Yesterday, the Money Series gave a snap shot of how Harlemites spend, who reside in the 10027 zip code. Today, the Money Series continues by turning our focus on the residents of 10030. The top three household spending areas for the 10030 Harlem resulted in health & family ranking first, with house & home next followed by shopping. The first two areas mentioned are identical to 10027 Harlem residents in terms of ranking. However, shopping ranks third for 10030 verses 10027 where it ranks fourth. On a 12 month average, household spending for 10030 includes: $798 for health & family. Insurance cost make-up $277 with school & child care not far behind at $234. The next large cost is charity at $173. Healthcare, pets and personal care round the remaining total. House & home follows with a total of $434. The majority of costs go toward utilities. Two-hundred and six dollars is dedicated to utilities. Next with $77 for home maintenance, $76 for home improvement and $75 for phone. The shopping category came in third in terms of the top three spending areas. Harlemites from 10030 spend a total of $332. That figure is divided among general shopping at $150, clothing, shoes and outer wear at $113 and $69 goes towards electronics, office supplies and hobbies. If 10027 and 10030 are compared in their two top ranking areas: 10027 spends $246 more than 10030 in health & family and 10030 spends $323 more than 10027 in shopping. All figures are created from an online money management tool and based on ages from 18 to 65 years of age and above, all households (married with kids or without, male or female single with kids or without), and income starting at $20,000 to $125k and above. The Money Series heads to East Harlem next. 10029 will be the focus! 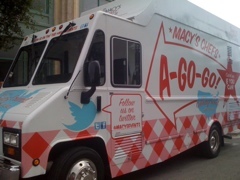 I have more details about Marcus Samuelsson’s July 31 participation in “Macy’s Chefs A-Go-Go,” a national food truck tour showcasing the Macy’s Culinary Council. The Macy’s Food Truck is rolling into upper Manhattan-126th Street and Riverside Drive to be exact-with our fellow Harlemite during Harlem Week, a month long celebration of the culture, arts, civil rights, politics, religion and community education. Perfect timing! Love it! 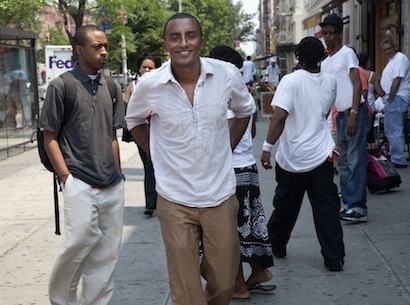 From noon to 4:00 p.m., Red Rooster Harlem owner and Chef Marcus Samuelsson will be on board at the Harlem stop, cooking his signature recipes and dishing them out for free! And guess what Marcus will be cooking? He will be serving catfish sandwiches with fried caper slaw and sweet potato fries! Yummy! That sounds delicious for lunch on Sunday, July 31. If you have not tried Marcus Samuelsson’s cuisine, here is your opportunity! And the best ingredient in Marcus’ food that day, it’s FREE! See you at 126th and Riverside, July 31 at noon! Cheers!